Wow, it's Thursday and I get to share a final week this month with my special friends over at Linkin with my Ladies - Thursday Hop. Check out the newest host. Please stop by and join us - make new friends or say "Hi" to old friends. Hope to see you there! Welcome to week #26 of the "Linkin with my ladies" Thursday Hop! Please say hello to your newest host! we encourage you to link up your Bloglovin URL in the Linky tool below our regular linky today. PLEASE LINK UP YOUR BLOGLOVIN URL ONLY. Use your blog's URL to link up in our regular linky. You can participate in both! 3. If you're new, leave a comment so we can follow you back! Meet our Lovely August Co-host team! Labels: blog hop , eclecticredbarn , Link party , Linkin with my ladies , Linkin with my ladies - Thursday Hop! Wow, it's Thursday and I get to share another wonderful week with my special friends over at Linkin with my Ladies - Thursday Hop. Check out this week's special new host. Please stop by and join us - make new friends or say "Hi" to old friends. Hope to see you there! Welcome to week #25 of the "Linkin with my ladies" Thursday Hop! Now I love my shabby looking treasures. Worn and chippy are fabulous. We especially love old and vintage tools. My husband and I both flock to these when out hunting. Many of the pieces I have are tools that belonged to my grand parents and my Dad. I love them in displays and have them scattered throughout the house. However, I do like to keep them that way. It may be only in hot and humid climates like here in Florida, but wood can dry out easily and if neglected too long, they will crack. (Especially pieces that I use outdoors.) Now this might be a good thing, but not for vintage tools. At least that's my opinion. Here are two tools that could use some TLC. Well, it is still raining here in southern Florida, although we have had periods of clearing, so I decided to bake. It seemed like everything I wanted to make, I was missing an ingredient. I had everything for this Almond Pudding Loaf, so that is what I made. I have been reading posts about places that have had little rain. Katie over at Katherine's Corner posted about the heat and water rationing and the affect on her Hollyhocks. Well, I wish I could send all of those who need rain some of ours. It started raining on Saturday (southern Florida) and basically has not stopped. 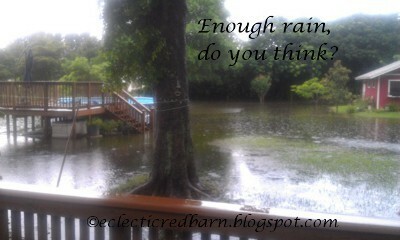 Needless to say, our yard is flooded and we have an acre under water. This picture is not great since it was raining so hard and it was dark outside. Welcome to Thursday Favorite Things Blog Hop 97. I am so thrilled to be co-hosting with Katie and Angel. What a great place for sharing your creative designs, recipes, tidbits, and other amazing ideas with your fellow bloggers. Please come and join the party. Make new friends or reconnect with old ones. Hope to see you there! Linkin with my ladies - Thursday Hop! It's Thursday and that means it is time to join Linkin with my ladies - Thursday Hop! I am so excited to be joining with these awesome ladies again this week. We hope you will stop by and join us and connect with some new ladies or reconnect with some old friends. See you there! Spots on your brushed nickel faucets? Do you get spots on your brushed nickel faucets? Well, I do. I love the finish of brushed nickel but it seemed like I could never get the spots off. It drove me crazy! I tried everything and nothing seemed to work. When I cleaned my bathroom, my faucets didn't look good. I am so excited to be joining with these awesome ladies again this week for the Thursday link up. We hope you will stop by and join us and connect with some new ladies. See you there! My husband went to West Virginia (Wheeling) for his family reunion. It was rather last minute so he decided to drive from Ft. Lauderdale and would pick up his brother in Georgia. Normally, he would have taken his truck, but 5 days before he left, he was rear ended and over $5,000 in damage. Fortunately, he is fine. So they gave him a Honda Accord. Somewhat smaller than he is use to. After a few days I get a call, would you like some chairs. Well of course. There were also three lamps. I will take anything. lol! I said, bring what you can. Here is what he brought me. So have you ever found a neat piece of furniture but it has a decal that can't be removed or a metal container that has a decal. You want to paint them, but how NOT to paint the decals. Never fear, it is actually easier than you think. I found this metal watering can at a garage sale for a $1. Nothing very exciting, but knew I could paint it. However, it had this "metal decal" and I didn't want to paint that. This watering can had some rust but since I was going to paint it, it didn't matter. I am so excited to be joining with these awesome ladies for this week's Thursday link up. We hope you will stop by and join us and connect with some new ladies. See you there! Welcome to week #22 of the "Linkin with my ladies" Thursday Hop! Do you have some great recipes that you haven't made in a very, very long time? Well, I do. I am not sure if I forget about them or with all of the new recipes showing up, they seem to replace my old favorites. Whatever the reason, I was looking for a recipe and found this Easy Cherry Squares and thought wow, I haven't made this in years. This would be a great dessert to make and send into my husband's office.